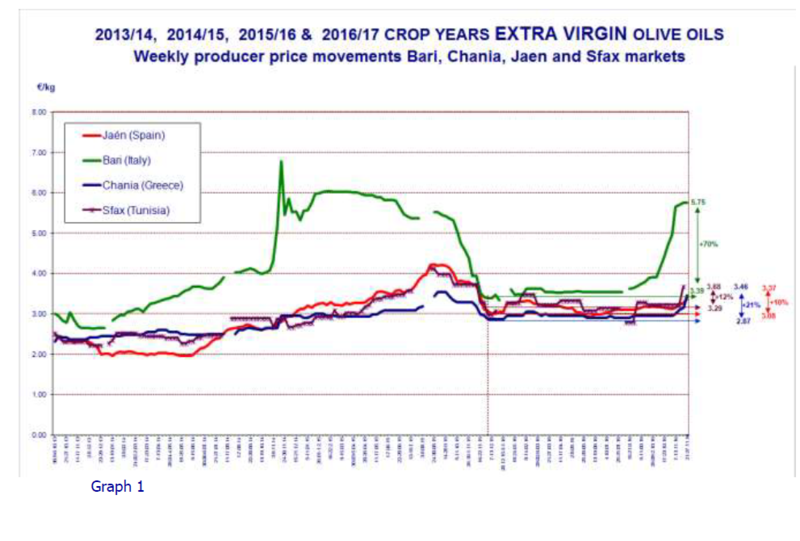 Graph 1 tracks the weekly movements in prices paid to producers for extra virgin olive oil in the top three European producing countries and Tunisia, while Graph 3 shows the weekly changes in producer prices for refined olive oil in the main three EU producers. 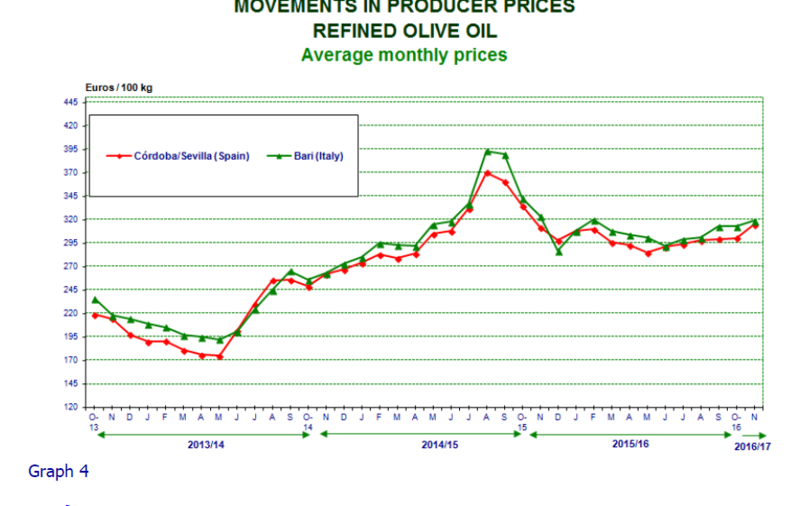 The monthly price movements for these grades of oil are tracked in Graphs 2 and 4. Extra virgin olive oil – Producer prices in Spain increased at a constant rate over the last few weeks coming in at €3.37/kg at the end of November 2016, which is a 10% year-on-year increase. If we compare this price with the maximum amount for the third week in August 2015 (€4.23/kg) it shows a 20% decrease (Graph 1). Italy – Producer prices in Italy started to climb at the beginning of August, intensifying at the beginning of November and breaking the €5 barrier at €5.75/kg at the end of November. This is a 70% year-on-year increase. 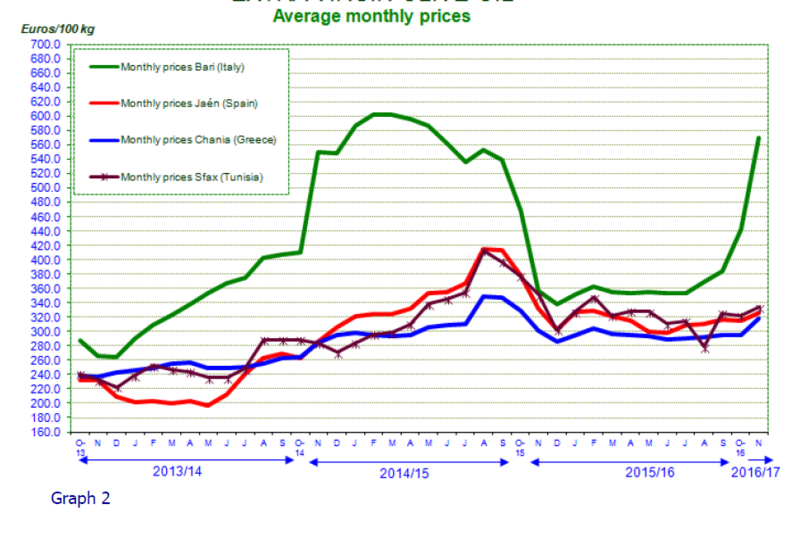 Graph 2 shows how the monthly prices of extra virgin oil behaved in recent crop years. Greece – Prices in Greece remained stable from mid-August until the beginning of November but, as in other markets, started to climb in recent weeks to come in at €3.46/kg at the end of November 2016, which is a 21% year-on-year increase. Tunisia – The prices in Tunisia had remained stable over the last few weeks, but then started to climb up to €3.68/kg at the end of November, which is a 12% increase compared to the same period the previous year. 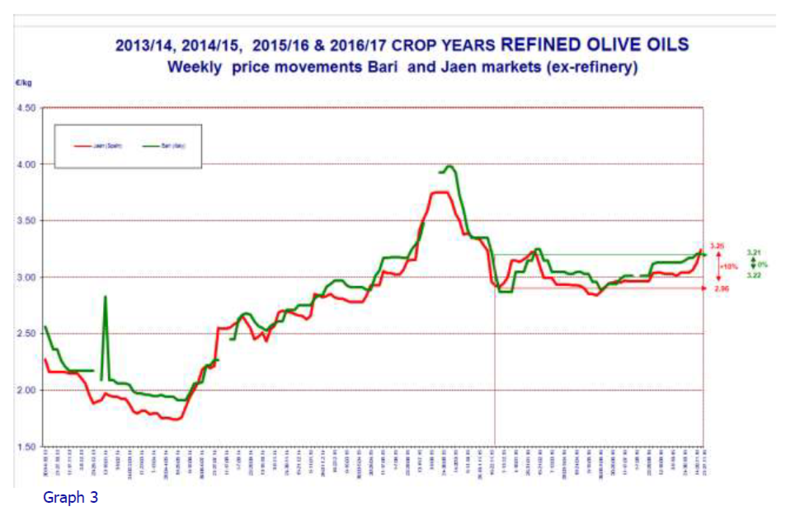 Refined olive oil: The prices of refined olive oil in Spain and Italy generally follow the same trend as the price of extra virgin olive oil. In Spain, they came in at €3.25/kg, which was a 10% increase on the same period the previous year. 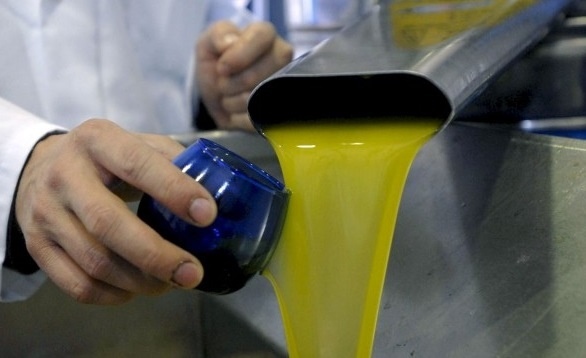 However, while prices for virgin oils in Italy rose in recent weeks, refined olive oil remained stable, coming in at €3.21/kg at the end of November, whereby there is no year-on-year change. No price data are available for this product category in Greece. At the end of November 2016 the price of refined oil (€3.25/kg) and extra virgin oil (€3.37/kg) differed by €0.12/kg. In Italy, the difference in price between the two categories is wider than in Spain at €2.54/kg (Graph 3). Thos prics in Spain for Extra Virgin Olive Oil are not correct, they are much higher. 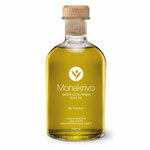 Old Evoo roun 3,40 Eur x kg anf Fresh around 3,50 or 3,60 Eur and we are having rain so we can not collet olives and produce Fresh. Poolred is not a place to find out rreal prices, its good for market tendencies only. Try to call Spanish producers and find out prices to prove what im saying. Most of thm does not have tock o sell yet.